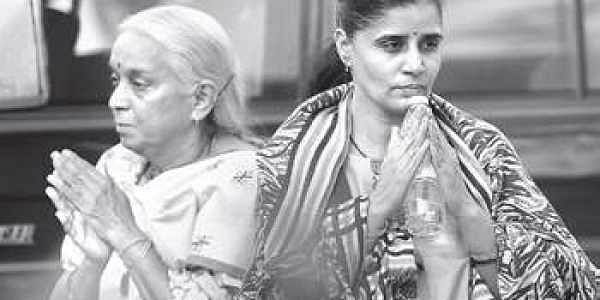 The wife (right) and mother of Kulbhushan Jadhav at the Foreign Ministry in Islamabad on Monday. Subsequently, he released pictures of the ‘meeting’, showing Jadhav, looking weary and haggard in a blue suit at least two sizes too large for him, speaking to his wife and mother divided by a glass wall. Later, Faisal told journalists in Islamabad that Jadhav’s mother Avanti Jadhav and wife Chetna Jadhav underwent a security check before being taken to the room for their meeting, which started at 2.18 pm and lasted almost 40 minutes. “Indian diplomats, including Deputy High Commissioner J P Singh, accompanied Jadhav’s family and were present during the meeting, which was conducted in a specially prepared room via an intercom through a glass partition,” he said. He also clarified that the presence of Indian diplomats during the meeting between Jadhav and his family did not mean Jadhav had been given consular access. After the meeting, Jadhav’s family went back to the Indian High Commission. They later returned to India via Oman. According to Pakistan, Jadhav was arrested on March 3, 2016, in a ‘counter-intelligence operation’ from Mashkel area of Balochistan, and confessed on camera that he was an Indian Navy officer working for Indian intelligence agencies. On April 10 this year, he was sentenced to death by a military court for espionage and sabotage. India says the confession was forced, and denies any intelligence links. Mumbai: Kulbhushan Jadhav’s friends and well-wishers in Mumbai have pledged to continue their campaign for his release even as his mother and wife met him in Islamabad on Monday.“As there is no evidence against Kulbhushan, the Pakistan government should release him immediately,” said Tulshidas Pawar, a friend of Jadhav. “Until he is brought back, our campaign will continue,” said Sachin Kale, another of Jadhav’s friends.